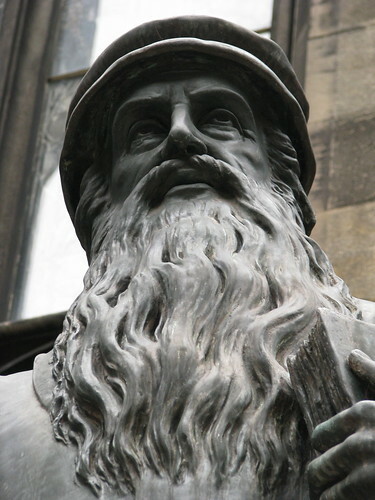 John Knox was ordained as a Roman Catholic priest, but left Catholicism and became the bodyguard for the Scottish Reformer George Wishart. After Wishart was murdered, Knox fled and began to preach. He was later imprisoned and exiled several times, joining English speaking protestants in Geneva and Frankfurt. Returning to Scotland, he taught that where true Christian living and worship were suppressed, the people could oppose the authorities by military means. The Scottish Parliament adopted the Scots’ Confession, officially entrenching the reformation of the Church of Scotland. Knox opposed Mary Queen of Scots when she exceeded her power, demonstrating how to say “this far and no further” and the basis on which we make these judgments: God’s word.